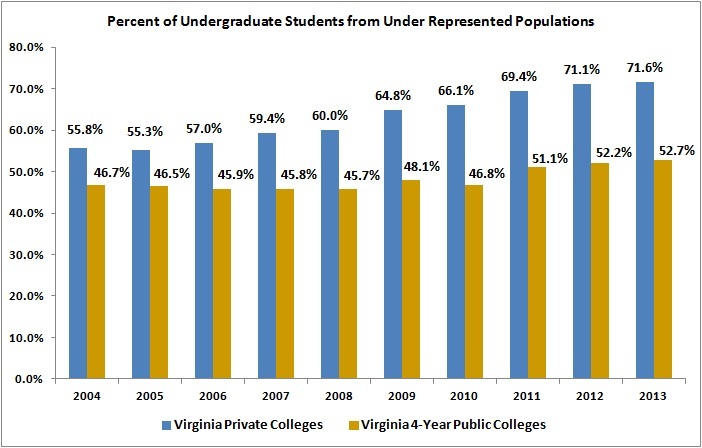 Virginia's private colleges have a commitment to increasing diversity on campus. 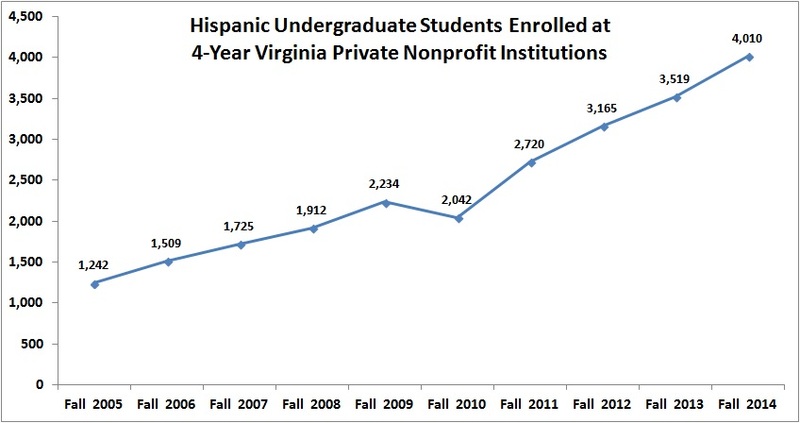 Over the past decade, the number of Hispanic undergraduate students enrolled at Virginia private colleges has increased 223%. 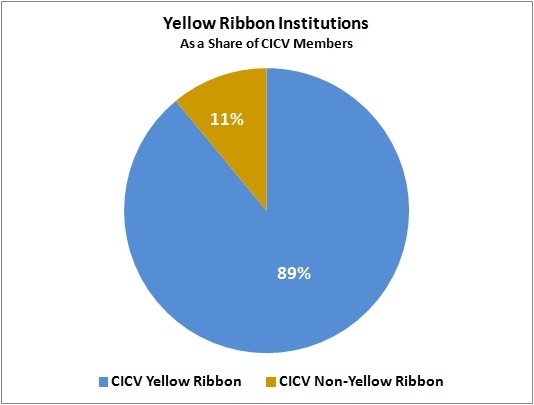 CICV institutions actively participate in the U.S. Department of Veterans Affairs Yellow Ribbon Program. The Yellow Ribbon Program is the post 9/11 GI Bill lowering the actual tuition and fees per academic year at a private institution. Private institutions that participate in the Yellow Ribbon Program agree to make additional financial aid available for the Veteran's education. 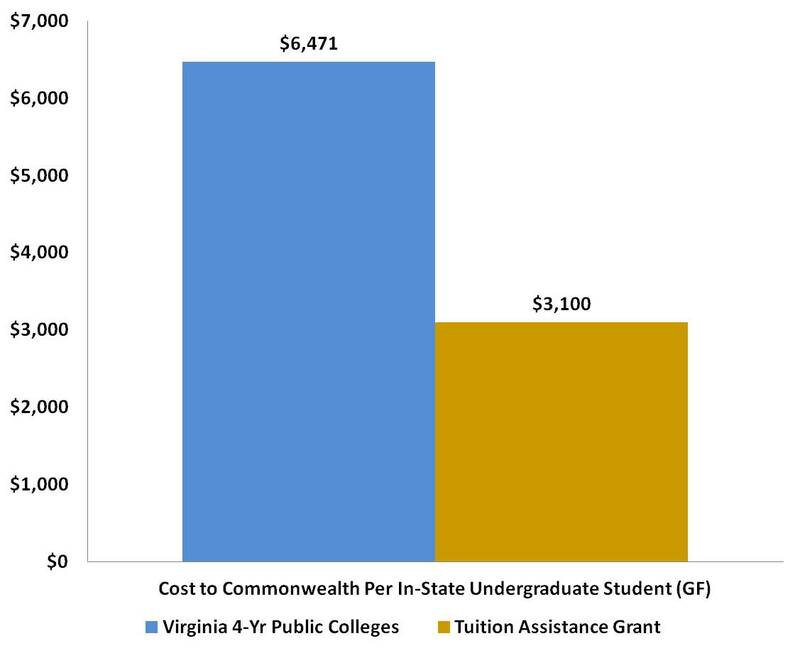 The cost to the Commonwealth to enroll an undergraduate Virginia student at a private college is $3,100, which is the amount of a Tuition Assistance Grant (TAG) award. 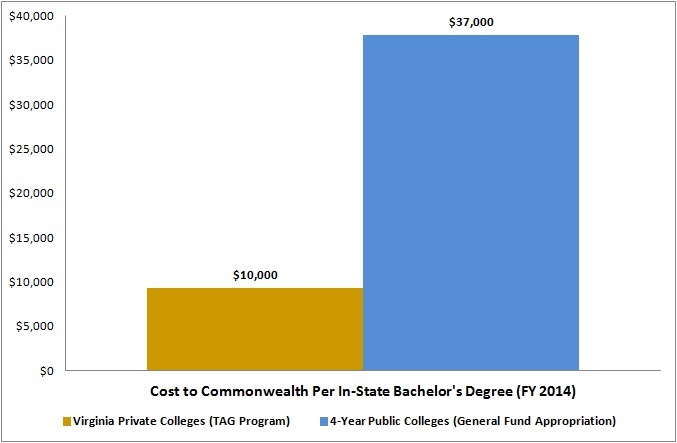 The TAG program helps Virginians receive a high quality education at a fraction of the cost to the Commonwealth. 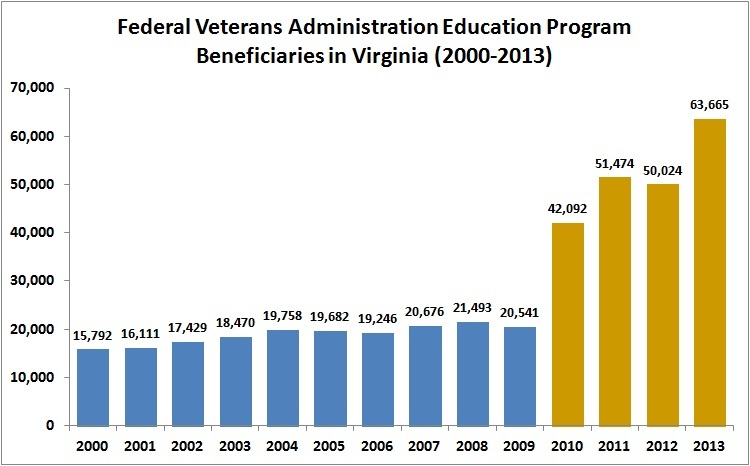 Virginia veterans using education benefits from the Veterans Administration have tripled since the beginning of the Post 9-11 program in 2010. On behalf of Virginia's private colleges and universities, thank you for your service to our country. 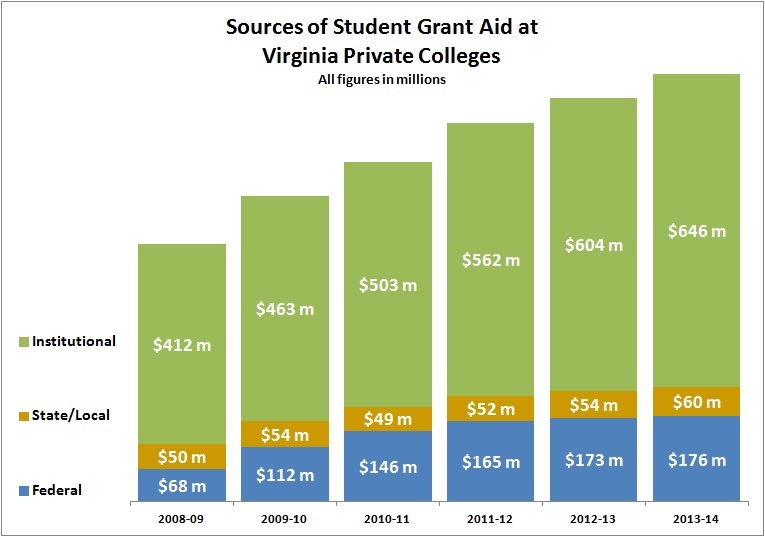 Virginia private colleges and universities invest their own resources in their students, providing almost $650 million in institutional grant aid to students last year. 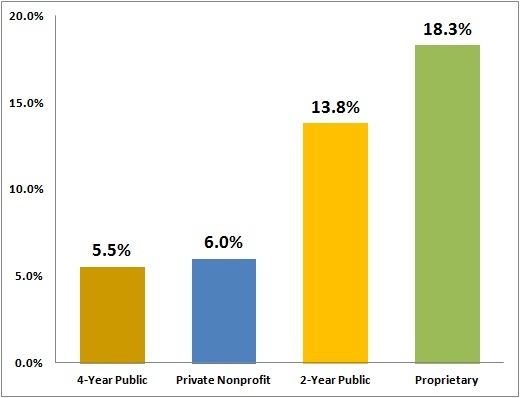 73% of all grant aid given to students was awarded by the institutions, 20% from federal sources (including Pell), and 7% from state and local sources. Employers seek college graduates with wide skill sets. They expect professionals to have both broad and major-specific knowledge and the ability to constantly learn, adapt and innovate. In the fast-paced modern workplace, liberal arts graduates from Virginia's private colleges and universities stand out as strong candidates. Image Source: The Council of Independent Colleges (CIC) website. Image and Creative Commons license may be accessed here: http://www.cic.edu/Research-and-Data/Liberal-Arts/Pages/Infographics.aspx. This year approximately 7,000 Virginians will receive a bachelor's degree from a Virginia private college or a university. The Virginia Tuition Assistance Grant (TAG) program helps Virginians receive a high quality education at a fraction of the cost to the Commonwealth. Source: State Council of Higher Education for Virginia (SCHEV) C01 Completions Report (2013-14); SCHEV FA03 TAG Report (2013-14); Department of Planning and Budget (2013-14 General Fund Data). A college degree is an investment that will continue to appreciate over a lifetime. 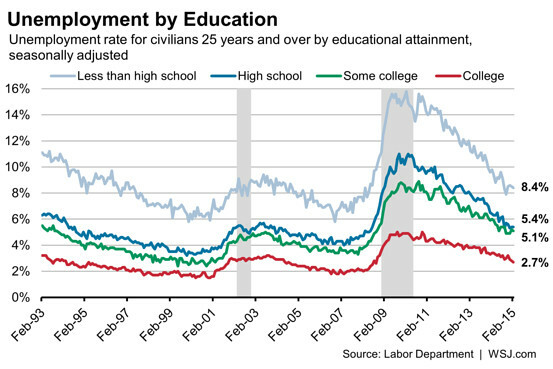 College degree holders have a much lower rate of unemployment than individuals without a college degree. Source: The Wall Street Journal. 2015. [ February's Jobs Report in 10 Charts]. Retrieved from http://blogs.wsj.com/economics/2015/03/06/februarys-jobs-report-in-10-charts/. Graduates from Virginia's private colleges and universities have a lower 3-year cohort default rate on student loans than the national rate of 13.7% and the state average of 10%.